I purchased this for my 16 year old son's room. High quality material. Colors pictured are accurate. Washed and dried well with no shrinkage. I would highly recommend this comforter set! Classically stylish, the Intelligent Design Roger Comforter and Sheet Set will bring a comfortable look and feel to your room. The comforter and matching shams sport a plaid print in a modern color palette of navy and taupe for a casual update. A complete sheet set features a contrasting navy flange that adds a striking accent to the sheet set, while an included decorative pillow and navy bed skirt provides dimension and a finished look. With its handsome combination of bold and soft colors, this comforter and sheet set adds visual appeal and comfort to any space. Solid sham with 4-inch contrast cuff. My son loves it in his college dorm. The size on the Twin XL is perfect. Washes and dries easily, cold water used. Looks just like the picture, colors are rich and it goes with so many colors as far as buying extra sheets for it. Would definitely reccomend this for anyone, spare room, etc. Two teenage boys..... was buying for one of them.... the one whom it wasn't for, took this and wanted to keep it! It is soft and comfortable, not overly hot. I personally felt like it will not keep them warm on a cold, Maine night because there is not very much fill in it but they love it. 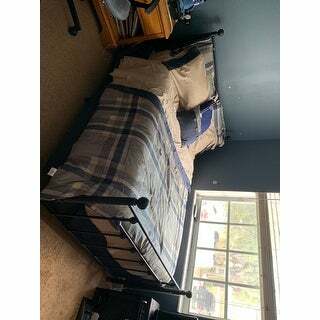 I purchased this Intelligent Design Roger Navy Bed set for my teen son. WOW worth every penny. Quality is excellent for the money. It has a silky feel to the comforter and pillows. The sheets are a little darker than the photo, more like a taupe but worked perfectly with the Eclipse Kendall Blackout Window curtains. The comforter is perfect weight without being too heavy but can be used without a blanker as it is plenty warm. I have washed the sheets a few times and no piling. don't waste your money. 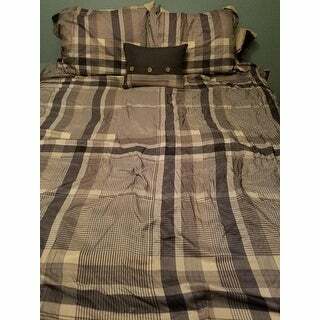 bought for guest room and washed before putting it on the bed. the material is very thin and seems like it would easily tear. the batting inside the comforter moved around during washing and drying and seems like it may have shrunk. generally, it doesn't feel like something anyone would want to sleep on and looks very messy. definitely disappointed. I bought this comforter set for my son's room. The colors are very nice. The material of the comforter itself is fairly thin but provides enough warmth. I recommend this product. Love the very bold and masculine colors of this full size bed in a bag set. The sheets have a semi-satin finish that gives them an elegant touch. Love it, good quality and it looks classy and clean. Only reason I didn’t give it 5 stars is because the fitted sheet is too small for the rest of the set. I was not happy with this bed set. It looked ok when I first put it on but after one wash it looked old and worn out. The colors faded quickly despite having washed it in cold water. I would not purchase again. The colors do not look anything like the photos. It was a great set considering the price. 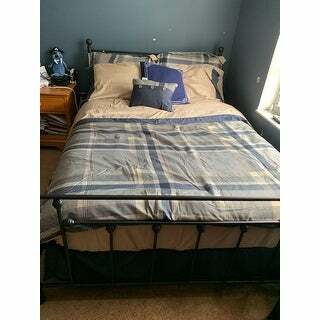 I purchased it for a guest bedroom so its not used daily but it is comfortable and serves its purpose. The colors are light and blend well. This is the perfect set for a teenager. Works very well, especially for the price. Bought it as a gift and haven't had any complaints. "Is there any gray in this comforter?" "Is the comforter & sheets made of microfiber? And does the fabric feel sueded or like a windbreaker?" This set is soft brushed microfiber. "What material and thread count are the sheets and pillowcases?" This set is polyester and does not have a thread count.